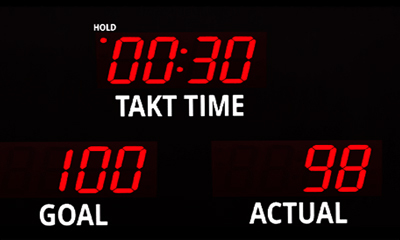 TAKT TIME can be defined as the maximum time allowed to produce a product in order to meet demand. It is derived from the German word taktzeit which translates to clock cycle. There is a logic therefore to setting the pace of production flow to this TAKT time. Product flow is expected to fall within a pace that is less than or equal to the TAKT time. In a lean manufacturing environment, the pace time is set equal to the TAKT time. With this three-in-one product, keep track of production or inventory count, monitor the time between production, and compare them to the company’s targeted goals. Use the Takt Timer to establish a “rhythm” and set a pace. When production is unable to match this pace, management can easily identify the source of the bottleneck. 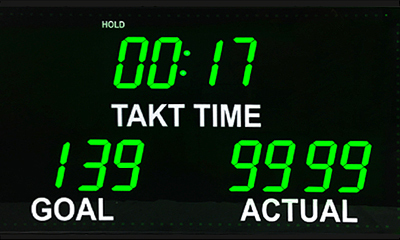 TAKT time production counters provide a real-time feedback system. Essential for lean manufacturing. ► Actual Count Up/Down by increment of one with switchbox or switchplate. ► Set TAKT time or pace with wireless remote. ► Goal display automatically counts up by one at zero. 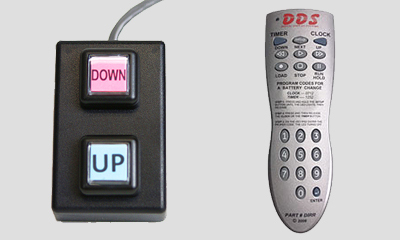 ► Easy switch between 2-digits or 4-digits counting. ► Single line bright red 4″ height digit display (2.5″ and 7″ models available). ► Sturdy anodized aluminum frame for indoor industrial use. ► Add flashing lights or audible buzzer alarm. ► VISUAL DESIGN RENDERING – Send us pictures of your applications and we will suggest affordable solutions for your visual communication needs. Proximity Sensors – Available in models using High-frequency oscillation to detect ferrous and non-ferrous metal objects and in capacitive models to detect non-metal objects. Models are available with environment resistance, heat resistance, resistance to chemicals, and resistance to water. Applications includes: Detects lead frames, aluminum caps, componenets, machine movement, cylinder positioning.